In the 2011 MIT Technology Review article entitled, "Solar's Great Leap Forward," the CEO of Suntech Power – the world's largest manufacturer of solar panels – predicts "solar grid parity" within 5 years. Solar grid parity is the point where the cost of installing a solar P.V. system is equal to the cost of installing a conventional power system to the end user, which is the building owner. In the same issue of the MIT Technology Review, Bill Gates of Microsoft makes the point that due to the scale of the energy sector, government support is often essential to maintain innovation. The increasing national support for solar in other countries is extensive. China, Japan and Germany, among others, have taken a progressively more aggressive stance by supplementing the “market pull” of taxes with the “market push” of direct market regulation, intervention and research and development. Further, the nuclear crisis at Fukushima, Japan, has prompted renewed support for solar from governments around the world. Germany, for example, announced that it will shut down all of its nuclear facilities in favor of solar, while China will expand its already world-leading solar manufacturing, and Japan will increase its solar P.V. production twenty-fold by 2030. The U.S. federal government has concurrently made massive investments in a solar support structure that will only provide the intended result with continuing U.S. federal solar incentives. Though the Section 1603 program does not offer financial incentives to solar P.V. manufacturers, its focus on stimulating solar installations has the potential to significantly improve the United States' energy future. Solar P.V. systems are reliable, renewable, clean, labor-intensive and, as technologies make P.V. systems increasingly efficient, cost-effective and energy independent. In other words, by taking a proactive stance about transitioning to a solar-based energy grid, the federal government can enable the country to reduce carbon emissions, reduce dependence on foreign oil, reduce the cost of energy, protect citizens from volatile energy markets, and create millions of jobs. The Section 1603 cash grant program has been utilized by numerous property owners throughout the United States. At a time when our global competitors are accelerating their country-supported solar initiatives, the U.S needs to support its own solar industry or we will be left hopelessly behind. The U.S. must, at a minimum, renew the cash grants in order to continue domestic demand for solar P.V. and remain competitive in the international market for solar. The material that follows provides more details about other countries’ accelerating commitment to solar with an emphasis on Germany and China's initiatives. After this review, the article explains why, in the context of these global developments, now is the time for the U.S. to hold its own and stay committed to solar cash grants during the 5-year grid parity transition period. The authors will also argue the importance of solar to job creation and the U.S. economy. In addition to the U.S., the largest solar P.V. manufacturing countries are China and Germany. Both countries have had historic and continuing impacts on solar P.V. technology innovation, production and policy. Also aggressive in their policies, if not yet their production scales, are Brazil, Canada, India, Israel, Italy, Japan, Spain, and Switzerland. China is the world’s largest electricity consumer and the largest manufacturer of solar P.V. materials. 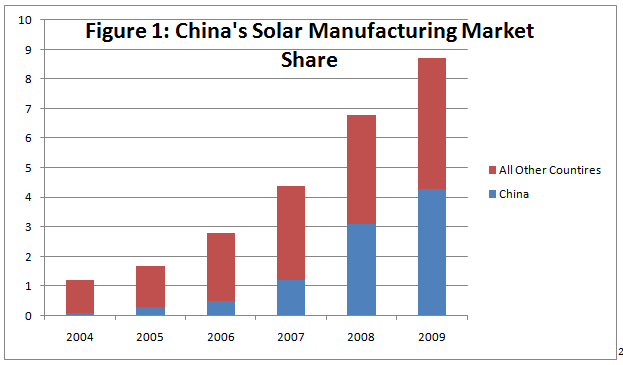 As of 2009, Chinese solar module production accounted for approximately half of worldwide market share (see Figure 1). This figure is expected to rise due to the central government’s solar-friendly policies, including subsidies to domestic solar panel manufacturers. For instance, the municipal government in Changsha recently transferred 22 acres of valuable urban land to a private solar manufacturer at a bargain-basement price to decrease the company’s costs and greatly increase its worth and attractiveness to investors. Likewise, manufacturers like Suntech have been able to cut costs through the Chinese government’s direct investment in the company as well as low interest loans made available through the central Chinese Development Bank. China’s proactive policies thus enable solar manufacturers to respond quickly and effectively to rising international demand at competitive price points. Further, China has recently increased its already ambitious solar targets for in-country solar installations. The country intends for wind, solar and biomass energy to represent 8% of its electricity generation capacity by 2020, up from the 4% currently . Germany has been a leader in domestic solar installations for many years. As a non sun-intensive locality, Germany's accomplishments demolish all preconceived notions about which nations can and cannot become leaders in solar power. At the turn of the “Solar Century, ” Germany primed the pump for widespread in-country solar installation by enacting the Renewable Energy Sources Act of 2000 (EEG). As a result of this initiative, the German grid now gets more than 16% of its electricity from renewable resources, enough to make it the world leader in this regard. In fact, due to the success of the EEG, the government has raised its target for 2020 from 20% to 30% renewable energy generation. In the aftermath of the Japanese earthquake, Prime Minister Merkel’s decision to shut down all existing nuclear facilities brings alternative energy, including solar, back to the forefront. Further, German companies are leading players in the global solar market. In 2000, the country passed a law requiring old, fossil-fueled utility companies to subsidize solar installations by buying their electricity at marked-up rates, making it easy for the newcomers to turn a profit. Known as a feed-in tariff, or FIT, this law was part of a bigger vision to cut Germany’s greenhouse gas emissions by one quarter by 2020. Germany established this goal in accordance with the Kyoto Protocol, a program that Germany takes very seriously. Germany’s solar initiatives have created nearly 300,000 jobs . This positive feedback loop between government policy, energy independence, manufacturing success, and job creation has eased political tensions surrounding the country’s decision to impose the FIT. With such forceful legislation behind it, Germany has used solar power to capture increasing market share and generate jobs despite the fact that it has the second cloudiest skies in Europe. 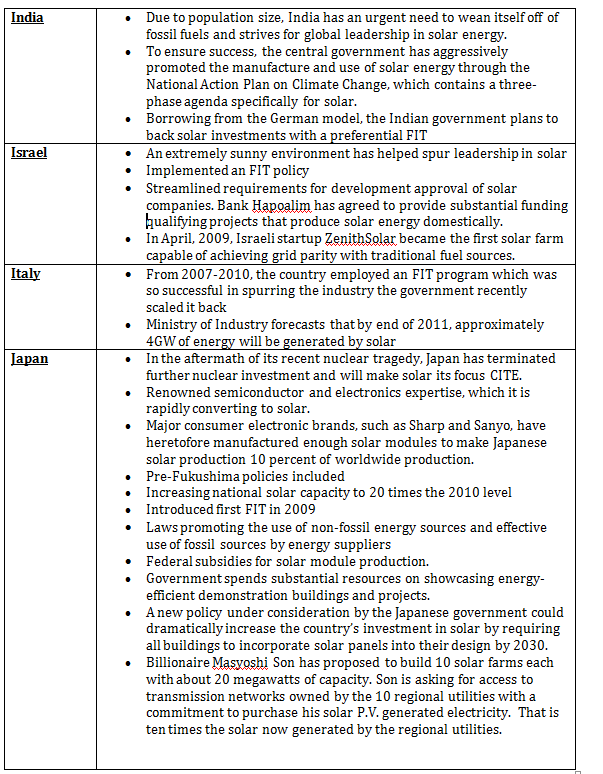 The following table (Table 1) outlines solar policies for several other nations. In deciding how the U.S. should pursue its solar policy, the U.S. has a lot to learn from Spain . Like many of the countries above, the Spanish government provided substantial subsidies to its domestic solar industry. However, Spain did not monitor its investments closely and many of them subsequently faltered out of the gate. In response, the government cut its incentives, causing the domestic solar industry to stall. The lesson is clear: Solar power requires intelligent, consistent support from the national government in order to thrive. With such a policy in place, grid parity is possible, and the U.S. can expect to then gradually wean the industry off of government support. The United States is just beginning to achieve major year-over-year increases in commercial solar installations. Incentives, both state and local, have pushed the U.S. solar industry as far as it has come. In particular, the 1603 cash grant program has been integral to the success of solar. Solar P.V. installations grew by 114% from 2009 to 2010, resulting in $1.145 billion worth of grants for solar energy projects to date. Moreover, industry analysts predict these figures to increase this coming year . “With analysts predicting that the U.S. will become the world’s largest solar market within the next few years, manufacturers are increasingly looking to the U.S. to site their facilities,” said Tom Kimbis, SEIA Vice-President of Strategy and External Affairs. In sum, as of the time this article is being written, 20.3 GW of solar power is either installed, being installed or in their development phase since January 1, 2010. According to Matt Rogers of McKinsey & Co., the 1603 program has been so successful because it gave clarity and confidence in how funds would be administered . The straightforwardness of a cash grant as compared to a tax credit gives companies certainty in an uncertain market, which has the added benefit of stimulating innovation and therefore job creation. Indeed, recent studies have shown that, during the recession, tax credits had limited utility because of corporations’ minor or nonexistent tax capacity. Cash grants are completely liquid and therefore companies’ tax capacity is not an issue. The following charts show the cost of grid-parity electricity as compared to the cost of a solar installation for large commercial building. A final chart below then shows how the 1603 cash grant helps close the gap between the cost of these two paths, helping to justify solar investments until grid parity can be reached. Based on the example above, it’s clear why the solar cash grant has been so successful at incentivizing solar projects: the grant reduces the excess financial burden by almost half! Without federal aid, this sample installation costs $600,000 extra as opposed to $330,000 without the grant. This remaining gap may be mostly or fully closed with lucrative state incentives, especially in states like New Jersey or California. It’s no coincidence that the states with the best solar development are those with the most generous incentive structures. Below are two tables (Table 2), one showing the states with the top ten solar-friendly policies in 2010 as measured by DSIRE, the other showing the top ten states for solar installations in that same year. The italicized states appear on both lists. As the table shows, there is 40% overlap between states with the best incentives in 2010 and states with the most installations. It should also be noted that Pennsylvania and North Carolina, two states appearing on the installation top ten, are also well-regarded with respect to their solar incentive programs. The states with the largest numbers of warehouses include California, New Jersey, Pennsylvania, Indiana and Kentucky. These states would continue to see increased rooftop solar development with a Section 1603 extension. The U.S. has greatly increased its overall financial support for solar. 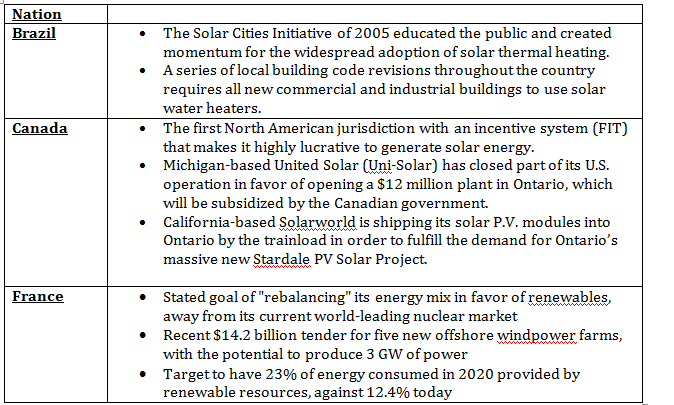 It is important to realize that the U.S. has recently made huge ancillary investment commitments to support solar P.V. including manufacturing P.V. investments, solar technology enhancements and improvements in solar installation processes. For instance, the Department of Energy has solicited proposals for the development of power electronics technologies that reduce the overall P.V. system costs, allow high penetrations of solar technologies onto the grid, and enhance the performance, reliability, and safety of the P.V. system. The department has also established foundations to provide funding for research into increased P.V. efficiency, decreased solar product expense, and better solar-to-building integration. Combined, the DOE’s funding amounts to $188 million. This information is summarized in Table 3 below. Solicitations for proposals, along with commitments for funding, are crucial to the overall success of the shift towards solar, since more efficient, less costly installation will help to accelerate grid parity. The U.S. Commercial Roof Square Footage Advantage. The United States is ideally suited for solar due to the enormous amount of roof space it contains. The U.S. has more roof square footage than any country on earth thanks to its plentiful warehouses, industrial buildings and big box retail centers. By some estimates, there is over 2.5 billion square feet of roof atop U.S. warehouses alone . This roof space amounts to a massive national resource the country underutilizes. The following table (Table 4) presents the potential electricity that can be provided by America’s incredible warehouse roof resource. It makes no sense for the country to terminate the 30% cash grant during the solar 30% tax credit period running through 2016, since many warehouses are owned by non-tax paying REIT's. A second large U.S. roof resource, big square foot retailers including Wal Mart, Kohls and Macy's have recently made great strides with solar. On top of the billions of square feet of rooftop space warehouses provide, several of the nation’s leading big-box retailers, such as Kohl’s, Macy’s, and Wal-Mart have already tapped into the power of solar electricity generation. In September, 2010 Kohl’s Departments Stores announced that it reached the milestone of its hundredth solar rooftop store. The retailer has taken an aggressive stance on solar; Kohl’s comprehensive energy management policy utilizes solar in order to fulfill its commitment to eventually become carbon neutral and has successfully installed solar modules in six states, including non sun-intensive states like Pennsylvania and New Jersey. Macy’s has also installed solar on top of a growing number of its sunnier locations. In California alone, the department store has already installed solar P.V. at 28 locations, generating over 8 MW of power. In fact, the country’s largest single rooftop solar energy system is now on top of Macy’s Goodyear, Arizona online fulfillment center. Yet like Kohl’s, Macy’s has also proven that you don’t need to be in a sun-drenched part of the country to integrate solar energy into rooftop space. Macy’s has installed solar panels atop several of its Northeast locations, including the Newport Mall in Jersey City, New Jersey and the Hamilton Mall in Mays Landing, New Jersey. Wal-Mart has installed solar P.V. modules at several of its stores around the country, particularly in sun-intensive states likes California, Texas, and Arizona, but the nation’s leading retailer still has thousands more properties that it can outfit with solar in order to achieve significant energy cost reductions. Since Wal-Marts are typically extremely large, wide buildings with vast flat roof space, they are perfect candidates for solar P.V. installations. Wal-Mart requires its suppliers to have alternative energy strategies, which presumably means Wal-Mart will have to accelerate its own solar P.V. progress . This momentum should be bolstered, not cut short. The federal government has been very transparent about the 1603 program and provides a monthly update on its use. The 30% solar cash grant awards are rapidly increasing and a groundswell of awards is expected as the December 31st deadline draws near. 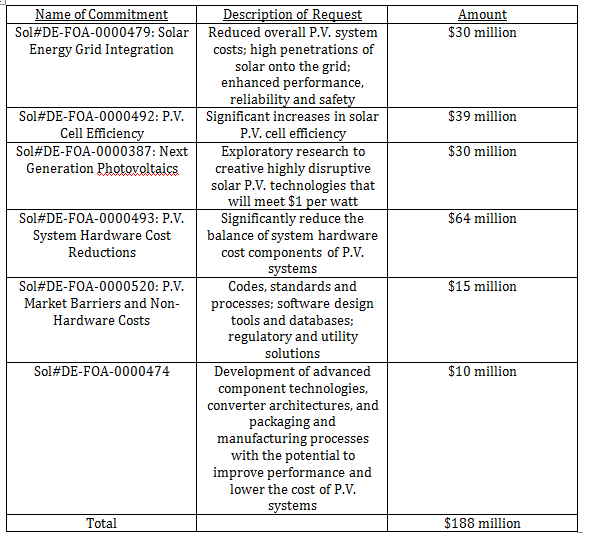 As of June 16, 2011, $1.145 billion in solar P.V. cash grants have been approved. Using the 30% grant rate this means that over $3,800,000,000 in solar projects used the grant program. A smart grid – a collection of advanced transmission and communication technologies for handling electric power transmission – is necessary to optimize solar power's potential. In desert areas, concentrated solar power can generate large amounts of electricity that must be stored and transmitted when needed. Further, end users of solar panels will want to sell their excess power back to the grid for use by others. With a well-developed grid, both of these goals can be accomplished. Countries like Germany are proof that solar power can account for a substantial portion of a nation's energy pie, and smart-grids are the key ingredient. The United States is the undisputed world leader in the software industry. A world-class smart-grid provides advantages beyond solar power, which is why major U.S. companies like Google, IBM, Cisco and Oracle have already made large investments in the development of software and Internet infrastructure. Google, for example, made Silver Springs, a smart metering company, one of its first investments in its newly formed venture fund. Continued solar cash grant support from the U.S. government would thus compliment major initiatives being undertaken by our nation's leading firms. Google has begun exploring a host of investments, some targeted at utilities and some at homeowners, who Google helps monitor and make adjustments to their energy use through iGoogle. PowerMeter is one such project, where Google and Energy, Inc. have teamed up to provide monitoring without the need for a meter. The $280 million boost Google is giving to home solar illustrates Google’s industry-leading commitment to developing the smart grid in order to accommodate solar electricity generation. Cisco spends $20 billion annually on smart grid investments. Like Oracle, the company emphasizes "end-to-end" solutions for utilities, meaning that it delivers advanced transmission and distribution automation tools and infrastructure to utilities in order to increase grid reliability and reduce expenses. Unfortunately, there has been speculation in recent weeks that the company will be forced to reduce its employee headcount by 10,000 during the summer of 2011. Renewed investments in the smart grid would create more jobs at Cisco and mitigate the company's potential need to lay off so many workers. IBM takes a broader approach to smart grid investment, focusing on systems integration. The company is involved with 150 smart grid projects. The most recent, a joint venture with utility Progress Energy helps utilities manage their distribution more efficiently. IBM’s smart grid commitment is part of its Smarter Cities Initiative, whereby the tech giant is positioning itself at the center of a worldwide shift towards automated, flexible, intelligent cities. Though the technology companies’ investments in the smart grid outlined above are a welcome development, government support is absolutely necessary in order to create an integrated smart grid on the scale needed to optimize solar efficiency. Smart grid support would be a major boon to solar power and the economy in general, as solar installations require significant labor and maintenance. If a non sun-intensive country like Germany with a population of 82 million can generate 300,000 jobs, the U.S. can generate over a million jobs with a consistent commitment to solar. Solar P.V. creates more jobs per megawatt of capacity than any other energy technology - 20 manufacturing and 13 installation/maintenance jobs per installed megawatt, according to a well-publicized University of California report. The New Jersey Public Interest Research Group reports that if only 10 percent of the homes in the Mid-Atlantic States used some solar power, 25,390 jobs would be created, with a payroll of $364 million by 2014. To further illustrate the awesome job creation potential of solar energy installations, consider the recently announced joint venture between AEP Ohio and Turning Point Solar LLC to build a 49.9 MW commercial solar facility, which is predicted to create at least 300 jobs over the course of its three year construction from 2012 through 2015, and another 300 once the facility is on line. Using Solarbuzz's estimate of 20.3 GW of completed or partially completed commercial solar installations, this means that solar is already responsible for the creation of 244,088 jobs in the U.S.
Not only is the installation of solar modules labor intensive, but there is a lot of labor that goes into the pre-planning stages of building solar preparation. To insure that the solar P.V. property is in the correct fiscal as well as physical shape, typically electricians have to install more energy-efficient lighting and roofers have to make roof enhancements. Solar design requires engineering review, financial analysis requires accounting work, and contracts require legal services. The solar installation process takes approximately 740 man-hours for every 100,000 square feet of rooftop space. When extrapolated to the entire 2.5 billion square feet of warehousing space in the U.S., warehouses alone present the opportunity to create 18.5 million hours of installation labor. Furthermore, those hours do not take into consideration the pre-solar installation of energy-efficient lighting, which will require millions of electrician hours, nor does it factor the pre-solar roof improvements and/or replacements, which will also require millions of roof installer labor hours. The total amount of labor hours that solar installations create truly is exponential. The existing 30% 1603 solar cash grant program is an unqualified success. As presented above, the world's largest economies are accelerating their commitment to solar. This support is critical during the 5 year solar P.V. grid parity cost transition period. At a time when the U.S. economy has trouble generating jobs in the face of escalating energy prices, this job-intensive alternative energy program should be continued. Without our country’s continuing commitment to solar P.V., our global competitors will outpace us in both alternative energy and job creation. Charles R. Goulding Attorney/CPA is the President of Energy Tax Savers Inc., The EPAct 179D Experts, an interdisciplinary tax and engineering firm that specializes in the energy-efficient aspects of buildings. Spencer Marr is an analyst with Energy Tax Savers, Inc., The EPAct 179D Experts. Charles G. Goulding is an analyst with Energy Tax Savers, Inc., The EPAct 179D Experts. *Note: This paper was prepared by Energy Tax Savers. It was not funded or supported by any other organization. Keith Bradsher, “China Leading Global Race to Make Clean Energy,” New York Times (January 30, 2010), available at: http://www.nytimes.com/2010/01/31/business/energy-environment/31renew.html. Kevin Bullis, “Solar’s Great Leap Forward,” MIT Technology Review: Energy Report 2011 15, 18. Charles Goulding, Jacob Goldman, and Taylor Goulding, “Tax Planning for the 21st Solar Century,” Corporate Business Taxation Monthly (February 2009), at 23. Elisabeth Rosenthal, “Solar Industries Learn Lessons in Spanish Sun,” New York Times (March 8, 2010), available at: http://www.nytimes.com/2010/03/09/business/energy-environment/09solar.html. Charles R. Goulding and Charles G. Goulding, “EPAct Tax Planning for the Top Ten U.S. Solar States,” Google Knol, (May 31, 2011), available at: http://knol.google.com/k/charles-goulding/epact-tax-planning-for-the-top-ten-u-s/1xedf26uc9hpj/31#. Glenn R. Mueller & Andrew G. Mueller, “Warehouse Demand and the Path of Goods Movement,”13 Journal of Real Estate Portfolio Management 1 (2007). Charles Goulding, Jacob Goldman, and Christopher Winslow, “The EPAct and Alternative Energy Tax Aspects of Wal-Mart’s Supplier Sustainability Program,” Corporate Business Taxation Monthly (June 2011).